Faster, stronger, and more effective, this NanoEnhanced Hemp Oil far outpaces tinctures. The advanced technology behind this ground-breaking liquid delivery system makes for precise dosing and immediate effect. Liposomal delivery brings the power of intravenous therapy into convenient oral delivery. 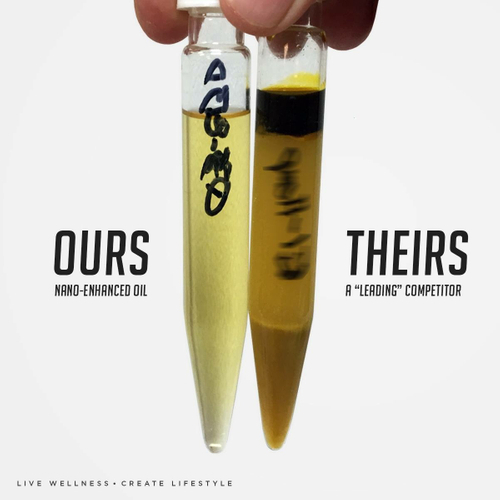 Typical absorption of Cannabidiol oil is poor, with only about 10% uptake in the GI tract. Liposomal encapsulation of compounds similar to Cannabidiol have been shown to increase absorbtion five-to tenfold. This pharmaceutical-grade LIPOSOMAL Cannabidiol outperforms other products thanks to smaller, more stable, single-layer spheres made from the highest-grade ingredients available. 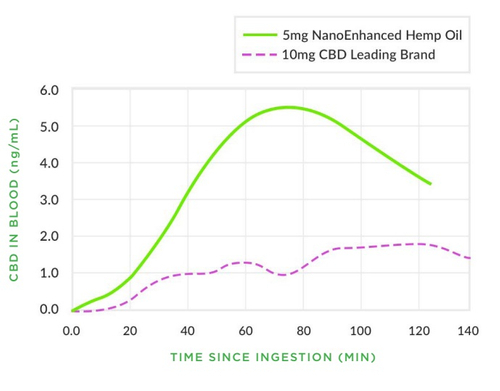 This pharmaceutical-grade NanoEnhanced Hemp Oil outperforms the leading pharma brand thanks to smaller, more stable, single-layer spheres made from the highest grade ingredients available, which has shown to increase absorption by 5-10 fold. 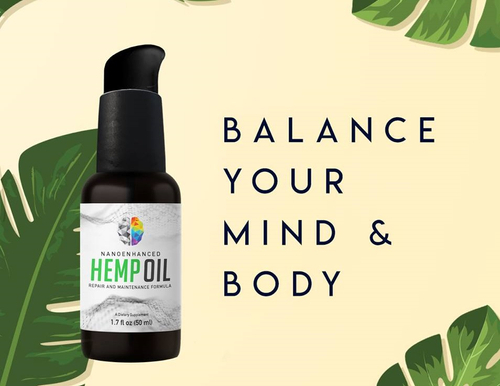 In a test against cannabinoid uptake results, published by a leading pharma brand, this liposomal hemp oil was absorbed in the blood in amounts three times as great at half the dose. In fact, phospholipid therapy, using both injectable forms and oral forms, has long and solid clinical history. The liposomes bring the power of intravenous therapy into convenient oral delivery. Unlike other liposomes on the market that use low grades of phospholipids, which breakdown and do not deliver compounds effectively, our high-phosphatidylcholine phospholipid mixes are smaller, more stable, and tightly distributed, single-layer spheres. The vesicles are small enough to begin absorption as soon as they hit your mouth; it’s lightning fast! The science behind why Phytocannabinoid Diol rich Hemp Oil is proving to be so effective is based on the human Endocannabinoid System. This system is part of our immune system and when it is activated by taking Cannabinoids, studies have shown the body has a better ability to fight, resist, and assist in repairing the body and mind. From infants to kids and adults to the old of age, studies have shown hemp oil to be safe to use, and its benefits well documented. As with any supplement, we highly recommend you consult your physician or a medical professional to see if hemp oil is right for you. Tightly controlled small sizing, verified by Laser Dynamic Light Scattering on each batch; Pleasant taste, suitable for intra-buccal delivery; Precise pump delivery; Easy to disperse in water when desired; Intramural delivery for best systemic availability; Easy to dispense and take directly from bottle. 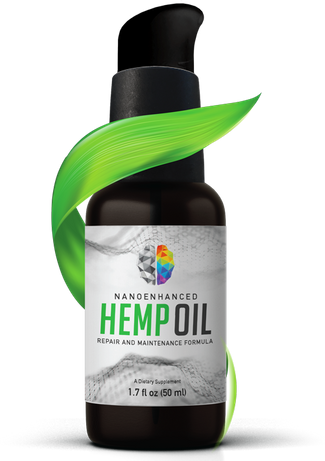 This NanoEnhanced Hemp Oil is made with the highest quality hemp strains grown to the strictest organic standards that we can find. We use a super-critical whole plant extraction process that yields all of the synergistic cannabinoids, terpenoids and other natural compounds of the original plant. This Hemp Oil is nonpsychoactive and safe for daily consumption. This website is owned by Annie’s Apothecary, independent affiliate of PrimeMyBody and is not endorsed by PrimeMyBody. Any opinions expressed on this website should not be construed as a representation of PrimeMyBody.